The Gotcha™ Original was the ﬁrst pre-assembled remote rescue kit. Designed for rescuing a suspended casualty from fall arrest lanyards, rope safety lines and fall arrest blocks, all possible from a point of safety. Casualties can either be raised or lowered to the nearest point of safety, with casualties initially raised to release their original attachment preventing the need for cutting. The kit comes complete with an anchor sling capable of attaching to a wide range of structures and all terminations are sewn for security. The kit is adaptable for different heights of anchor point, colour coded for simplicity and includes an extension pole for remote attachment. 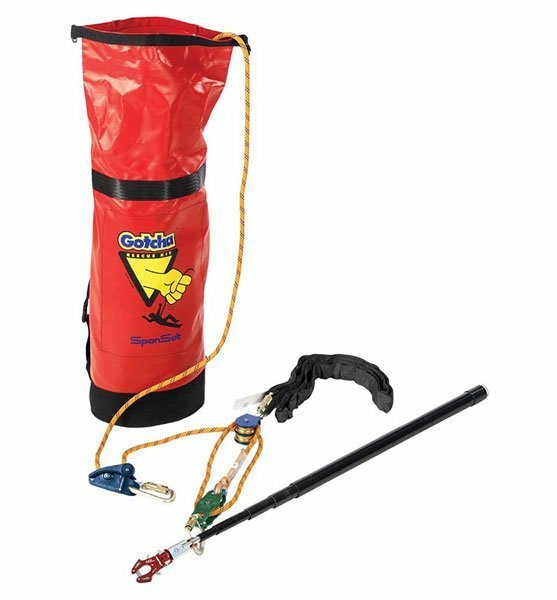 Included is the Grabba for rapid rescue from rope safety lines or fall arrest blocks.